4 bedroom, 2 bath – boasts 2 king,1 queen 4 single beds -sleeps 10. 1 extra kitchenette in master suite. 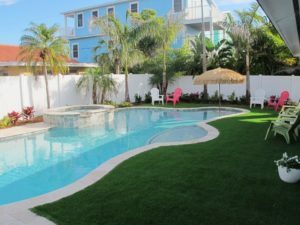 Largest heated residential pool on the island- large hot tub spa. Flat screen tv’s in every room, wireless internet, 2 washer & dryers, outdoor grill- all this is literally across the street from the beach! Lots to do near by – shopping, dining, water sports, golf and more!